TV5 celebrates all things Marvel with a fun, fresh string of animated and live-action features starting Monday, April 15. The Kapatid Network is sharing some of the most exciting Marvel features with Pinoy TV viewers in the lead up to the premiere of Iron Man 3. Kids better brace for a different kind of excitement every weekday as TV5 showcases action-packed Tagalized animated movies inspired by Marvel’s best-selling books, The Ultimates. Young Kapatid viewers can look forward to watching Planet Hulk on April 16, Doctor Strange on April 17, Thor: Tales of Asgard on April 18 and Ultimate Avengers 2: Rise of the Panther on April 19. Next week, the following Marvel animated movies will also be shown on TV5: Next Avengers: Heroes of Tomorrow (April 22), Hulk vs Thor and Wolverine (April 23) and The Invincible Iron Man (April 24). All these will air on the Kapatid Network at 9:30AM. Those who fancy a different kind of Marvel experience should also stay tuned to TV5 as some of the world’s most popular superheroes are dropping by Sine Ko 5ingko. The Marvel movie madness at 8:00PM will surely bring out the hero in everyone—Spider-Man starring Tobey Maguire and Kirsten Dunst, Daredevil with Ben Affleck, and X-Men with Hugh Jackman and Halle Berry. On Friday (April 19), Peter Parker returns to battle the evil Dr. Octopus in Spider-Man 2. The adventure continues through the weekend as fans can enjoy Sine Ko 5ingko's double- feature of Ghost Rider with Nicolas Cage and Eva Mendes on Saturday at 4:30PM and Wolverine starring Hugh Jackman on Sunday at 8:30 PM. The following week on Sine Ko 5ingko proves to be just as exciting as even more Marvel favorites will grace the small screen at 8:00PM. 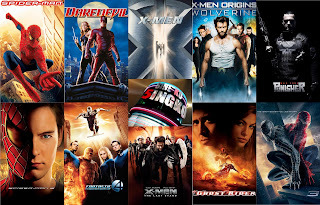 On April 22 (Monday), the mutant crew led by Professor X returns to the Kapatid Network for X-Men 2. Viewers should also tune in on Tuesday night as brilliant billionaire Tony Stark faces a different kind of threat in Iron Man 2, in time for the Wednesday showing of the franchise’s third installment. The original green giant Incredible Hulk rampages across TV screens on Wednesday night, while Thursday will see the Fantastic Four battling an intergalactic threat in Fantastic Four: The Rise of the Silver Surfer. On Friday, X-Men: The Last Stand sees the conflict between mutants and humans reaching an exciting climax. On Saturday (April 27), viewers can watch Frank Castle wage his one-man war against a mob in Punisher: War Zone at 4:30PM. The two-week Marvel marathon ends with Spider-Man 3 on Sunday night at 8:30PM. As a special treat for Kapatid viewers, TV5 is offering the chance for avid Marvel fans to win tickets to the special TV5 block screening of this summer’s much-awaited Marvel movie: Iron Man 3. Starting this week, viewers can join the Sine Ko 5ingko Watch N Win Promo. To register, they just need to text: SINEKO5 REG and send it to 5656. All they need to do next is to keep watching TV5 and wait for the “Superhero of the Day” that will be flashed on the screen while watching their favorite Marvel movies.